The John Fornachon Memorial Library develops and maintains a major collection of historical, current and relevant print and digital resources, and offers a range of information discovery tools and services to all stakeholders. The objective is to ensure that all involved in the Australian grape and wine sector have timely access to published technical and scientific information to support learning, understanding, and the adoption of research outcomes. This project builds and manages the library collection through strategic sourcing of new materials, managing copyright compliance requirements, cataloguing materials into the library databases, and preserving materials to ensure continued access over time. It will continue to seek innovative ways to deliver technical and scientific content, and facilitate the use of that information and knowledge, through the use of digital technologies. The library continued to invest in eBooks during 2017/2018, with the collection growing to 143 titles. The library’s eBooks are easy to access and can be read across a range of devices or downloaded for offline use. 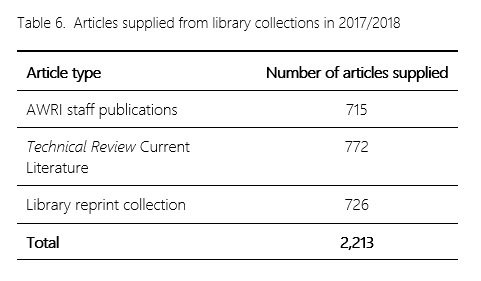 The staff publications database, accessible from the AWRI website, received more than 5,430 hits this year with 715 staff publications requested and delivered. The database contains more than 2,000 citations of publications authored by AWRI staff and is updated regularly to ensure the latest publications are available. Online information packs are collections of relevant references and other resources focused on a single topic. They have been developed to help users easily locate the information they need on common topics including oenology, viticulture, sustainability and wine and health. The website received more than 1,580 hits on information packs and the library delivered more than 539 articles from information packs. The library responded to 1,100 reference and information requests and delivered 2,213 articles. More than 80% of the requests were completed within one business day and over 85% were received via the AWRI website or other electronic means. Table 6 outlines the types of articles requested and shows a fairly even split between AWRI-authored publications, current literature from AWRI Technical Review and the library’s reprint collection. Library staff also conducted 64 specialised literature searches in 2017/2018 on topics including winemaking, vineyard management, biosecurity, winery operations and wine and health. A project to migrate the current library management system to a new platform is in progress and nearing completion. Once complete, this system will deliver a modern, fully featured, adaptable and future-proofed library system. Users will see significant improvements in user experience, accessibility and collection discoverability and will be better equipped to search, access and request information via the online library catalogue.